7/18 Cup of Coffee: While former Red Sox prospect Mookie Betts was leading off the All-Star game and onetime Boston draftee Alex Bregman was taking home MVP honors, it was business as usual on the farm. 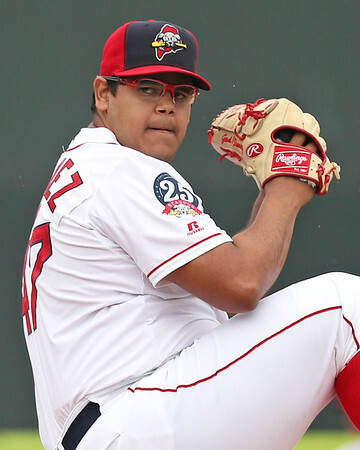 Dedgar Jimenez (pictured) dominated as Portland participated in a pair of pitchers duels, splitting 1-0 games in its doubleheader with Binghamton. The GCL Sox came from behind in the bottom of the ninth, while the PawSox fell in extra innings. It was a tough loss for Pawtucket, falling in the 11th inning on a night it stranded 13 baserunners. Justin Haley struggled in his start, allowing five runs in 4 1/3 innings, including a home run to White Sox top prospect Eloy Jimenez. Williams Jerez was outstanding out of the bullpen, striking out four against just one walk in 2 2/3 hitless frames. The left-hander has now punched out 65 in 47 1/3 on the year. Tony Renda was 4 for 5 at the plate and is now 13 for 27 since moving up from Portland last week. Renda has a 10-game hitting streak across two levels, with multiple hits in eight of those contests. Sam Travis doubled and walked as part of a 2-for-4 effort. Tuesday's twinbill in Binghamton saw some outstanding pitching, as both teams combined for just one run apiece. Dedgar Jimenez dominated in Game 1, going all seven innings for the complete game shutout. The big lefty surrendered only two hits over the seven frames, striking out five and walking three. Jordan Betts doubled and drove in the lone run as part of his two-hit effort, while Tate Matheny also added a pair of hits. Both teams featured bullpen games in the nightcap, which remained knotted at zero until Binghamton walked off in the bottom of the seventh. Daniel McGrath and Matthew Gorst both went three scoreless innings, with McGrath striking out five without issuing a walk. Betts picked up another two hits, giving him four on the day. Nick Lovullo doubled for Portland's only extra-base hit. It was a tough evening for Greenville, with its seven-game winning streak came to an end. Hildemaro Requena pitched better than his line indicated. After surrendering four runs in the second inning, Requena held the Legends at bay through the sixth, allowing only two more hits over those final four innings of work. In all, he gave up four runs in six innings, striking out six and walking two. A resurgent Pedro Castellanos had a pair of doubles and drove in two runs. He has now hit safely in seven straight, and has four doubles in July after compiling only three through June. Victor Acosta also doubled, his 20th of the year. Heavy rains ripped through Lowell, postponing the opener of the Spinners' three-game set. The team's will try again on Wednesday morning, with a doubeheader scheduled for 11:00am. It was a tough assignment for the Sox, with 2017 first overall pick Brandon McKay getting the start as part of a rehab assignment. The Sox, were no match for the Rays phenom, as McKay struck out seven in four hitless innings, but came back with three runs in the bottom of the ninth, claiming the win on a Ricardo Cubillan walk-off walk. Brandon Howlett got his team on the board with a solo home run in the fifth inning, his first as a professional Howlett also singled, walked, and scored the game-tying run. Howlett is 11 for 22 during a six-game hitting streak. Jonathan Diaz also doubled as part of a two-hit day, and Cubillan singled twice before the decisive free pass. On the mound, Ryan Fernandez continues to impress, striking out three in three shutout innings. The 23rd-round pick has started off with 10 consecutive scoreless innings over four appearances. The Sox fell despite another solid outing from Jorge Rodriguez. The lefty scattered three hits across four scoreless innings. On the year, he has surrendered just seven runs in 33 innings, with four of those tallies coming in one appearance. Oscar Rangel reached base three times, going 1 for 2 with a double and two walks. Player of the Day: It has been a tough encore for Dedgar Jimenez to his 2017-breakout campaign. After posting a 3.02 ERA in 146 innings across two levels, Jimenez has struggled for Portland. He went into Tuesday evening's start with an ERA that had been hovering just below 6.00 for most of the season, but he shaved nearly a half-run off that mark with a sterling seven inning complete-game shutout.